Our Price: $109.95 ( 60% OFF ) Blue Blocker AR! Lens Upgrades: Half Rimless Frames or (No Frame/Wired Bottom) Add-On. [Add $15.95]*Select this option if your frames or glasses are half rimless (Seiko lenses include anti-glare AR). This Premium Blue Light Blocking Anti-Reflection Lens is perfect for computer users. This new lens technology protects your eyes from damaging blue light and offers 100% UV protection. Bye, bye eye strain! This is not tinted/sunglass lens. All lenses include free scratch guard, and perfect mounting into your frame. Every job is completed and verified by licensed opticians at our USA lab. Compared to: $239.00 retail. This lens includes premium anti-reflection AR treatment. *Note, this lens option is available up to -6.00/+4.00. There may be an add-on charge for cylinder greater than 2.00. 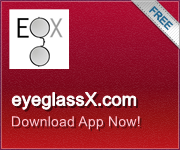 If you have any questions, please email or call us (info@eyeglassx.com).